Whanganui-based Dr Paul Beumelburg, who graduated last week with a PhD in Development Studies from Massey University, lived on Mangaia (population 700) for four months over three visits. It is the most southern of the Cook Islands group, said to be the oldest in the Pacific at an estimated 18 million years. Based on his Mangaian case study, he argues for greater recognition of indigenous local knowledge and culture in Pacific Island curricula when students are studying local economic, social and environmental issues. Framed in what is known in the development field as "hopeful post-development" he says "smart" indigenous knowledge – including traditional ways of managing scarce resources and how to be an ecosystem guardian – can be combined with modern science and technology to the benefit of island communities. He argues this hybrid wisdom could also be shared globally to challenge over-consumption and waste among developed nations. It was through his earlier experiences as a schoolteacher in Vanuatu, Niue and the Cook Islands, that Dr Beumelburg became concerned about the impact of a Western-style educational curriculum that devalued or ignored indigenous values on students living in Pacific Island nations. Dr Beumelburg, who began as teacher with Volunteer Service Abroad in Vanuatu in the mid-1980s, then Pukapuka Island in the Cook Islands followed by a stint as Head of Science in Niue High School, says he began to question the value of a western-style education when he returned to the place he first encountered the Pacific education system. "In 2013, part way through my PhD study, I returned to Vanuatu after a 27-year absence for a reunion with some of my ex-students in the capital, Port Vila. Invariably, they were the students who had progressed to post-secondary education and, in their early forties, found themselves with good careers. They expressed their appreciation to me for helping them to attain the lifestyles they enjoyed. Whilst happy for these former students, and now friends, I also reflected on what might have happened to the students who had returned to their villages. Teaming this interest with his personal connections – he is married to a Cook Islander he met during his travels and whose father is from Pukapuka and mother from Mangaia Islands – he decided to investigate how Western ideas about sustainable development were colliding with indigenous knowledge and traditional culture. On Mangaia, where his marital connection opened the way to acceptance into the community, he set up a cultural advisory group comprised of community and school leaders and parents. He conducted individual and group interviews with students, teachers, parents and community leaders about their ideas, values and practises in regard to sustainable living and how these fitted into the education system. He says life on Mangaia was "relaxed but rewarding". 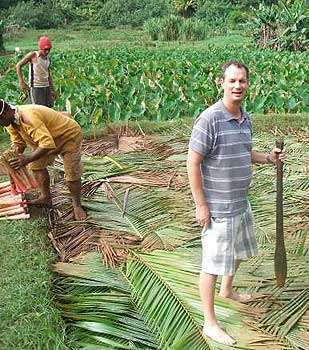 He enjoying planting taro and fishing, and appreciated the friendliness of the islanders. "People wave out to you as you travel around the island by motorbike. They always stop to talk. Mangaians love to share their culture with outsiders, and they are incredibly generous, inviting you to family functions or dropping off fish or taro at the house you are staying at." Many Pacific nations, Dr Beumelburg notes, have adopted the New Zealand education curriculum and its qualifications system via historic links. He believes they now need to take a more critical approach about what kind of education system is relevant for their students, and to confidently weave together elements of their own indigenous knowledge and culture with imported knowledge systems. "While aspects of the western-centric education these students received provided life skills, much of it might only have held minor relevance to the lives they led in their villages. A question I asked myself: Why had students not also been educated, at school, to explore their culture and take advantage of the multiplicity of livelihood opportunities that exist back in their villages?" The challenge for Pacific Island cultures is in navigating the tensions between individualistic and collective approaches to living, he says. In contrast to European paradigms, many Pacific Islanders typically earn more status for the amount of wealth they are able to give to others, and not how much they can accumulate for themselves. Gift sharing and respect for the elderly are the norm in traditional culture. However, the younger generation is more acquisitive for technology and goods through the power of social media; and this contrast in thinking creates tensions. "Instead, students could begin to imagine futures where partial participation in global economic and labour markets is now possible alongside renewed opportunities to draw on the social, cultural and practical resilience that traditional livelihoods provide through increased food security and social cohesion," he says. They can also envisage more flexible lifestyles, involving temporary migration to build a financial base followed by a return to traditional way of life in the islands. His thesis, which has been placed on the Dean of the Graduate Research School's List of Exceptional Theses, is titled A"piianga no te oraanga akapuapinga e te taporoporo i te ipukarea—Education as Sustainable Development: Mangaia, Cook Islands," and was supervised by Dr Rochelle Stewart-Withers, Professor Regina Scheyvens and Professor Huia Jahnke.